Thought Leader, Celise Kalke, Shares Her Eight "Slogans of Management"
Announcing the Idaho State-Civic Symphony's 2019-2020 Storied Season! You have three opportunities to bid on violins from the Idaho State-Civic Symphony's Painted Violin Project! Review: Some experiences . . . resonate so deeply that it’s best to leave writing about them to the poets. Synchronicity Theatre's Three Little Birds was featured on WSB-TV! Thanks for tweeting about Synchronicity Theatre's Three Little Birds, Bob Marley! Congrats to Core Dance's Anna Bracewell-Crowder for a year of amazing work! Atlanta's Synchronicity Theatre to Bring Back A Year With Frog and Toad! 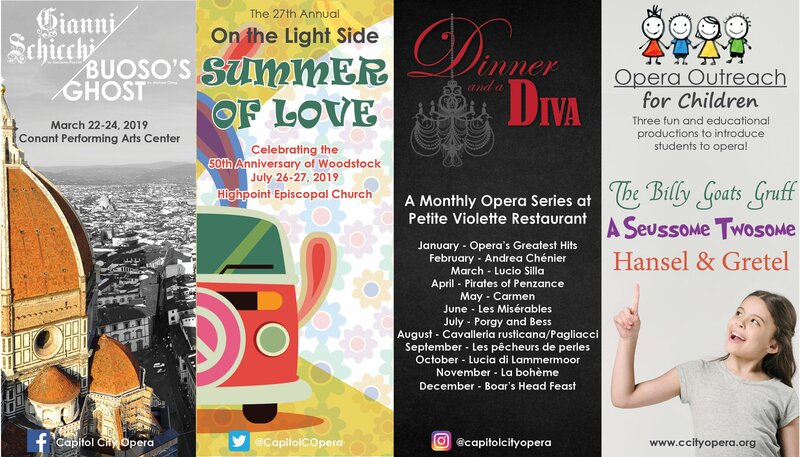 Capitol City Opera Announces its 18-19 Season! The [L] Agency would like to welcome the Idaho State-Civic Symphony to its roster! Synchronicity Theatre's Playmaking for Girls Featured on CBS! Four [L] Agency Clients Receive Bloomberg Philanthropies Grants! Synchronicity Theatre's 18-19 Season Has Been Announced! Synchronicity Theatre Announces 18-19 Stripped Bare Arts Incubator Projects! Core Dance Announces 18-19 Season! What's next for John Lemley? EnCore Dance on Film Festival is May 25th. Learn more! Capitol City Opera's Wine, Dine and Win is right around the corner! Did you hear? The Pittsburgh Symphony is nominated for a Grammy! Atlanta's Synchronicity Theatre took home FIVE Suzi Bass Awards! Read more. Capitol City Opera is Killing it in the 2017-2018 Season! Learn more. John Burke and the Superstratum Band are Hitting the Road! We are thrilled to be working with the Pittsburgh Symphony Orchestra this season! Take a look at what's on deck! Atlanta's Core Dance Presents its 2017-2018 Season! CONTEST! Share this video with the hashtag #Superstratum for a chance to win a copy of John Burke's new album! We are pleased to welcome Core Dance to The [L] Agency family! Stay tuned for info on Core's 37th season of compelling, original dance. Atlanta's Synchronicity Theatre Has Announced its 20th Smart, Gutsy, and Bold Season! We'd like to introduce Grammy-nominee John Burke's NEW album, Superstratum! On sale 09.10.17. Find Your Rah with Stripped Bare: Hannah Cremation + The Ash, a new rock musical by Rebekah Suellau and Sarah Beth Moseley, May 16 & 17 at Synchronicity Theatre! Lauren Gunderson's The Heath is “like a Shakespeare hoedown that might make you cry.” Opening May 4 at Atlanta's Synchronicity Theatre! We are thrilled to welcome Grammy®-Nominated pianist & composer John Burke to The [L] Agency Family! Dream the impossible dream with Capitol City Opera's Man of La Mancha -- March 24 - 26 at Conant Performing Arts Center at Oglethorpe University! Opening February 3 at Synchronicity Theatre is The One and Only Ivan, based on Atlanta's local legend, Ivan the Gorilla! Atlanta! If you haven't fled the country, check out The Taming on Inauguration Day! Waddle, waddle, tap, tap, tap! Mr. Popper's Penguins is poppin' up at Synchronicity Theatre December 9th! Synchronicity Theatre's Anne Boleyn is a hit! The Sinkhole Comedy show is coming to Synchronicity Theatre September 3. Invite your friends! The Billy Goats Gruff are solving problems in a new opera for kids! Synchronicity Theatre announces its 19th strong, gutsy, bold season! Tuned out? Tune back in and join Synchronicity Theatre for Beyond Reasonable Doubt: The Troy Davis Project, opening 04.08.16. Baltimore Cocktail Week is March 22 to 31, 2015! Shake it up, Hon! John Lemley to join the team at AM 1690 WMLB, The Voice of the Arts in Atlanta. TUNE IN beginning February 2 to hear John Lemley's City Cafe in its new and exciting format! The [L] Agency has expanded its services. Check it out! WABE's John Lemley has a new website! The Spivey Hall Children's Choir has a new, fully-loaded website! Check it out! Mezzo-Soprano Heather Witt has a new site! Check it out! Get 2-for 1 Tickets to Capitol City Opera's Sweeney Todd through February 7! Check out this John Lemley demo reel! Stevens Interactive Productions and the Theatre Plus Network Roll Out New Look! Check it out!